Catholicism in Berlin dates back over 150 years, and it is here that the history of All Saints Catholic Parish begins. Around 1848, when the early settlement of ‘Strong’s Landing’ began, a number of Irish Catholics petitioned Bishop John Martin Henni, head of the newly created Diocese of Milwaukee, for someone to perform the services of their faith in their new settlement. Rev. Father Colten, a missionary priest walked the 26 miles to and from Oshkosh carrying his vestments and Mass supplies in a knapsack. The first recorded formal Catholic Mass was held in 1851 and celebrated in Badger Hall on the corners of Pearl and Huron Streets of Berlin, which was the beginning of St. Joseph Parish. In the late 1800’s, a large influx of Polish settlers caused the need for a second Catholic parish. One of those immigrants, Albert Hopka, met a Roman Catholic priest, the Rev. Father Bronislaus Buczynski, who had been assigned the task of ministering to the Polish community that settled in the Fox River Valley. Mr. Hopka invited Father Buczynski to visit his home in Berlin and celebrate Mass there. The year was 1870 and this is recorded as the beginning of St. Stanislaus Parish. In 1885, a group of Polish and German Catholics petitioned the Bishop to establish a second Polish parish on the west side of the city, and so a third Catholic parish was established. Bishop Xavier Katzer of the Green Bay Diocese chose the name of St. Michael for this new parish. As each parish grew, educating its children became a priority and each parish constructed its own school. St. Joseph School was staffed by the Sisters of St. Agnes; St. Stanislaus, the School Sisters of Notre Dame; and St. Michael, the Felician Sisters. In 1979, after years of planning, the three Catholic schools joined together into one school system, known as Berlin Catholic School. In 1991, the school building, convent and chapel at St. Michael’s were remodeled and all school classes were combined into one building, where All Saints Catholic School is located today. As the Diocese of Madison began the process of developing a strategic plan to address the challenges facing the Diocese with the decreasing number of priests the three parishes were combined into one parish, the first in the Diocese. On July 1, 1998, Father Jerome J. Maksvytis, pastor of St. Stanislaus, answered the call of his Bishop and agreed to serve the entire Catholic community of Berlin with the linked parishes of St. Joseph, St. Stanislaus, and St. Michael. Through a united, yet difficult, and sometimes painful process, the three linked parishes began the work of integrating. On August 24, 1999, after a great deal of prayer, the Berlin Catholic Community petitioned the Diocese of Madison to merge and become one single parish. As a result, on July 1, 2001, All Saints Parish was created to meet the needs of the Berlin Catholic Community. The Most Reverend William H. Bullock, third Bishop of Madison celebrated this event with a votive Mass for All Saints on July 8, 2001. And so at the dawn of the 21st century, approximately 900 Catholic families in Berlin and the surrounding area continue the tradition of building, sustaining, and growing in their Catholic faith, united in the Spirit, as the parish family of All Saints. 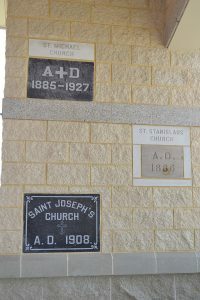 All Saints Parish was established July 1, 2001 with the merger of St. Joseph, St. Stanislaus, and St. Michael Parishes. – The first merger of parishes in the Diocese of Madison. But Catholicism in Berlin dates back over 150 years, and it is here where All Saints began growing in the spirit as one catholic parish united in Christ. In 2002, after much prayer and discussion, plans for building a new church were set in motion by the Core Building Committee. After a fund drive in 2005, construction began after Easter 2006. Doors to the new church opened July 22, 2007 with the church dedication and celebration. After much discussion and prayer, a campaign was kicked off in the fall of 2011, for funding the 2nd phase of the building plans, which included the administrative wing offices and parish social hall. Construction began mid-summer of 2013 and was completed with a blessing in April 2014.